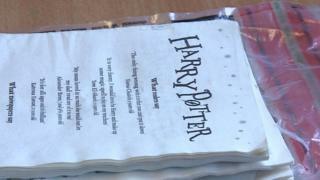 A Harry Potter book sprayed with drugs was smuggled into one of the UK's most "challenging" prisons, where inmates are suspected to have smoked the pages. A copy of Harry Potter and the Goblet of Fire found in an HMP Nottingham cell tested positive for a psychoactive substance similar to Spice. The jail is one of 10 on which the Prisons Minister has staked his career. Rory Stewart vowed to resign if improvements failed, but he admitted Nottingham was "causing concern". He pledged in August to step down if the number of assaults at the 10 prisons did not come down by this summer. Mr Stewart said "early indications" from talking to staff were that violence was coming down with "real progress" in six or seven jails and he was now "pretty confident" he would keep his job. However, the minister admitted "two or three" of the 10 jails were proving difficult, with Nottingham and Wormwood Scrubs in west London the ones he was "most worried about". Nottingham's governor said conditions were improving but the jail remained "fundamentally unsafe", the term used in last year's inspection report. The "Spice-like substance" found on samples from the book was detected by a new drug-testing machine, installed as part of a £1.4m investment to refurbish HMP Nottingham and bolster security. It is thought the drugs had been sprayed on to the paper before it entered the prison. Four hundred pages were missing, which staff suspected had been torn into strips and smoked. Prison officer Adam Donegani said each strip was worth about £50. "The prices are inflated within the prison service (compared with) street value, so that can be whatever they want to charge for it," he said. In January 2018, Peter Clarke, the chief inspector of prisons, triggered the "urgent notification" procedure at Nottingham after concluding it was "dangerous, disrespectful and drug-ridden". "This prison will not become fit for purpose until it is made safe," he wrote. The procedure compelled the Justice Secretary to draw up an action plan to bring about improvements, including reducing the population by 200 to 780. In last year's inspection report, Mr Clarke said HMP Nottingham needed to do "much more" to tackle the problem of drugs which was "inextricably linked to violence". Phil Novis, who took over as governor in July, acknowledged it was taking longer than he would have liked. In his first week a prisoner died, allegedly murdered by another inmate, and since then there have been three self-inflicted deaths. "The prison is fundamentally still unsafe and that remains a challenge for us," Mr Novis said. "Every day there's an assault on my colleagues and on other prisoners, that's regretful." He added: "It is getting safer, but it's coming from such a low threshold that it's going to take time to get to a place where I and everybody can feel safe wherever we go." A group of experienced prison staff have been brought in to coach and advise officers at Nottingham, where 59% of the workforce have less than two years' service. Prison officer Grace Hanselman, who used to work in a call centre, said the mentoring scheme had given her more confidence to deal with prisoners harming themselves. "When you come into contact with somebody that is threatening to take their own life or attempting to take their own life that's probably the scariest, most daunting situation I've found myself in," she said. "To have that experience there, to reassure me and the prisoner that we can help... was really beneficial." The £10m scheme announced by Mr Stewart last year to improve security and conditions in jails is likely to be extended to other failing prisons, he has announced. Mr Stewart said: "There is still much to do, and I do not underestimate the scale of the challenge, but the first six months have given us a solid platform from which we can set a more positive direction for all our prisons."